*Disclaimer - I received complimentary tickets from Hershey Park to facilitate my review. All opinions are that of my own. Are you looking for an awesome time at an amusement park? 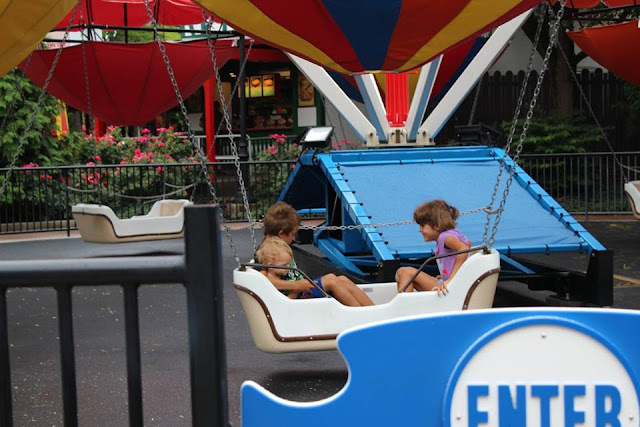 Our first time to Hershey Park was such a wonderful time for everyone! 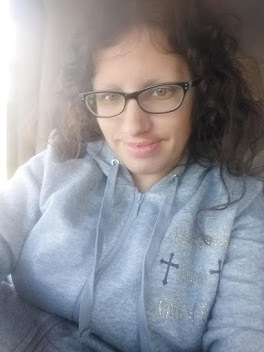 We took our four kids, as well as met my parents there so it was a lot of fun and there is SO much to do, for all ages not just older kids. I love the layout of the amusement park and how easily accessible the food and restrooms are. They have maps as well for finding where each ride / section is. To buy tickets, check out the link HERE. They also have options for buying season passes and for groups, so choose the one that you need the most! 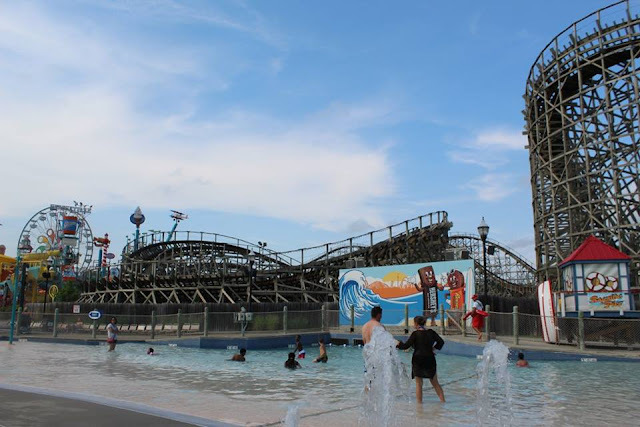 They also have a link that tells you about the different seasons for Hershey Park and the hour and prices for each one. 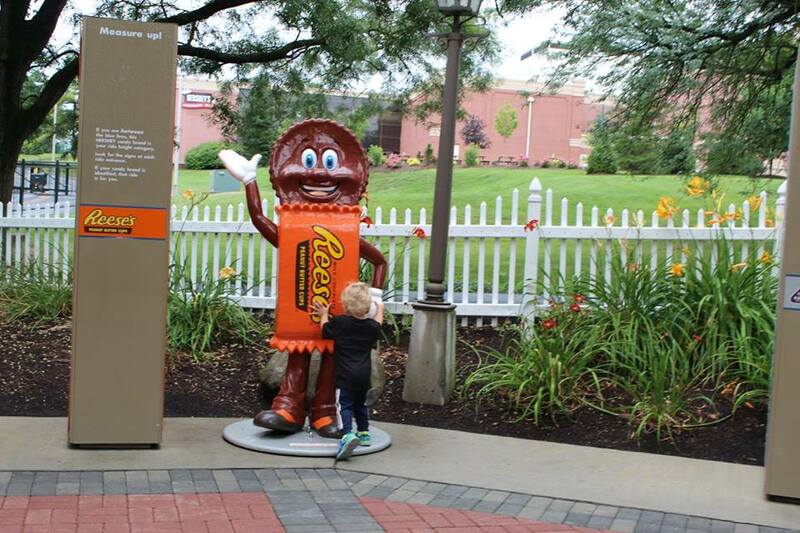 Before entrance into the park, there are statues of Reese's, Hershey Kiss, and one other. Our toddler as you can see had fun with these! He liked to give them each a hug before we walked into the park with our tickets. We were about 30 minutes early, so we had good entry of not many people in lines throughout most of the day actually, which was really awesome. Our toddler had a blast and was able to ride quite a bit of rides, which was awesome. I want you to see some of the rides we did with our kids, as well as just us throughout the day on Friday. 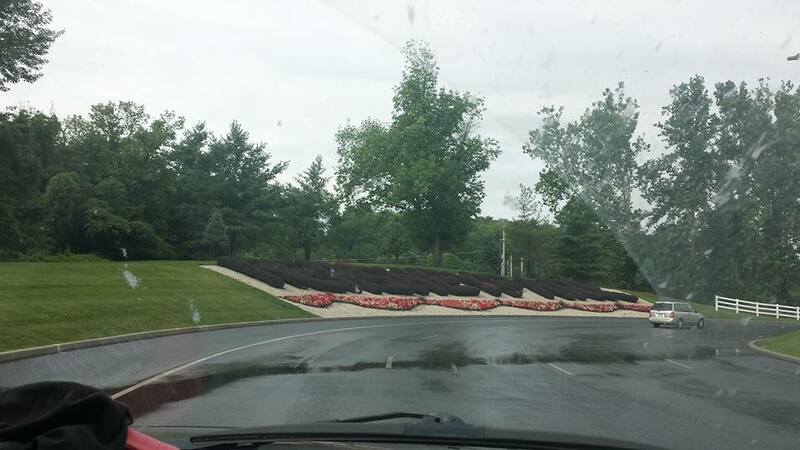 We saw this neat Hershey Park grass sign as we were driving into the parking lot. It was perfect weather wise for the most part, it only rained for a short while but other than one roller coaster being a little delayed, nothing was closed so it was great! 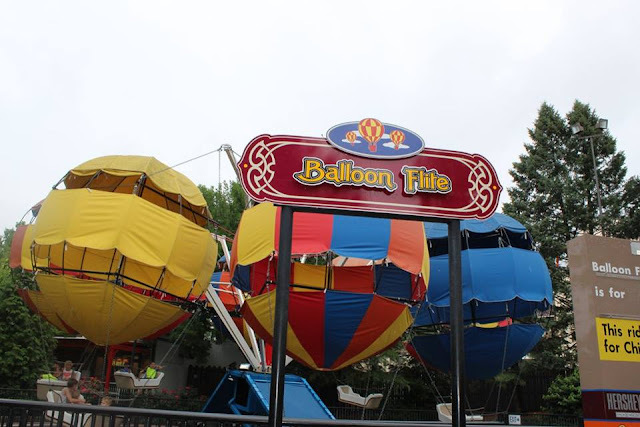 Our older three kids went on the Balloon Flite ride, and our two year old absolutely loved it! He went on this ride probably three or four times. He had a lot of fun being able to ride it. Another fun ride our toddler enjoyed was the Carrousel which he rode the horse that goes up and down, with my husband standing right beside him and his big brother was on the on the other side of him. Here is a roller coaster from a glimpse that our oldest son and I rode. It goes FAST and is quite intense speed wise, and with the turns it has. It goes up to 75 MPH on this one. He loved it and wanted to ride it again. As you can see, it goes straight up and pretty much straight down too. It was fun but really fast, so I had to take shoes and glasses off before. 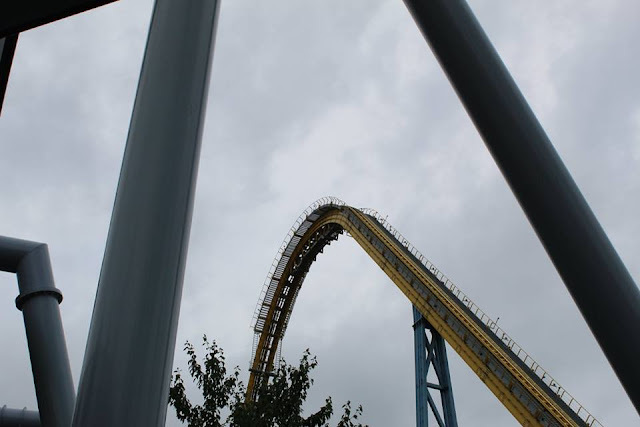 Hershey Kisses: 36" to 42"
Hershey's Milk Chocolate: 48" to 54"
The name of this roller coaster is the Sky Rush. With this ride, we had basically a 5 minute wait time is all, aside from the 10 - 15 minute hold from it raining. But, all in all it was a lot of fun, and of course kids, teenagers, and adults alike who can ride will likely have a great time on it. Just be sure to remove anything from your pocket and your glasses too. We stopped for a little bit to get some shakes and when I say a shake, I mean a King Size Shake from Simply Chocolate in the park. These are absolutely DELICIOUS! These are pretty large in size too, so you get your money's worth. 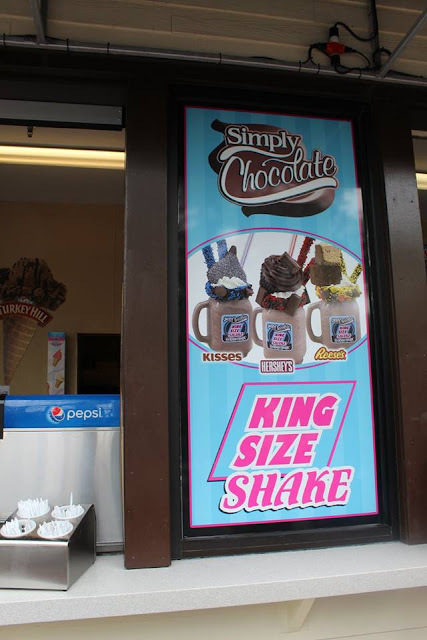 They are $14.99 for a King Size Shake, but are worth every penny! I got the Reese's flavor, and so did my husband and we shared with our kids. We will most definitely buy one again. They also have Kisses, Hershey's, and Reese's flavors to choose from. 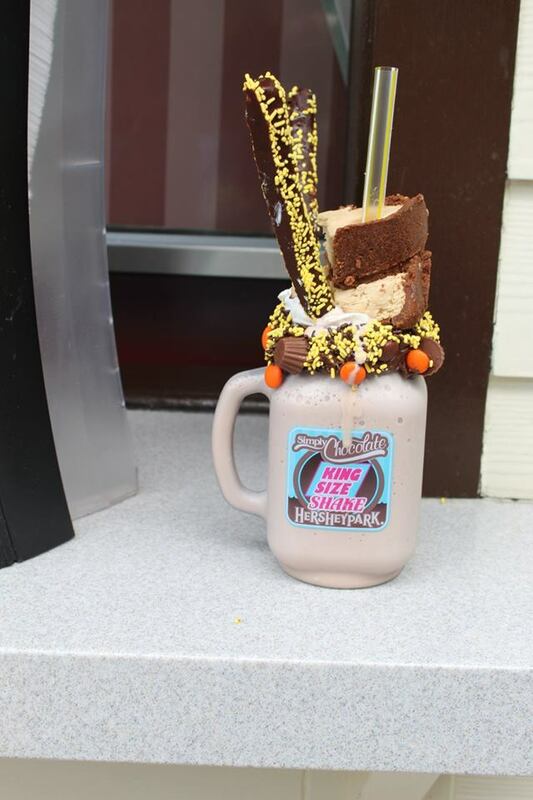 Check out what all is on this amazing King Size Shake! 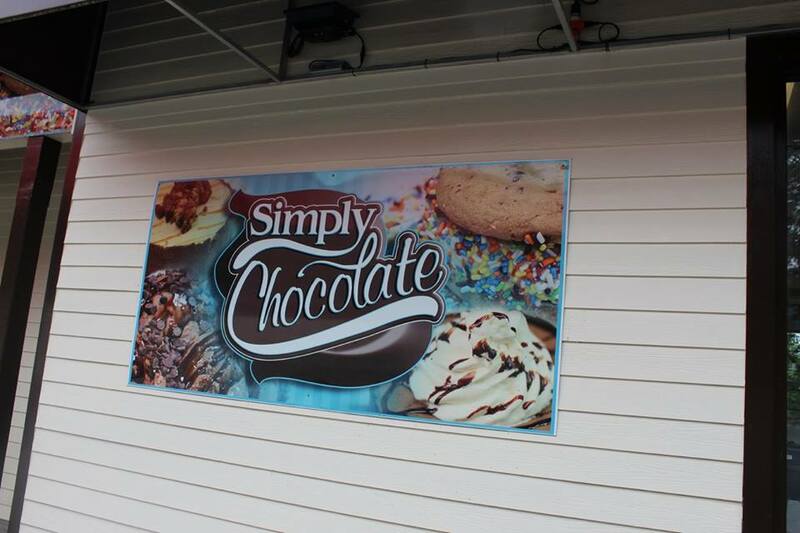 There are two chocolate dipped pretzels with sprinkles, a huge two pieces of a Reese's cup, the shake, and mini Reese's cups, and some Reese's Pieces to top it off on the side. The thing I love too is that I could just go wash the cups out in the bathroom and dry them off and took them home to re-use them! Inside of the park at no additional cost, there is a really fun area called ZooAmerica! It has so many different animals to look at within glass, and outdoors too. 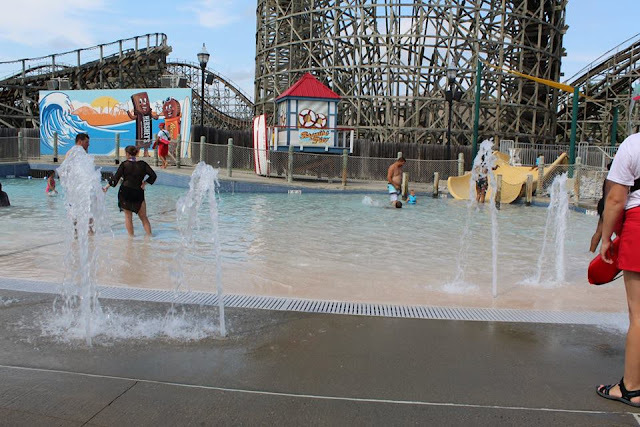 Our kids LOVED this part of Hershey Park, and I highly recommend taking part of your day there to check it out while you're there. It's a nice walk to take especially if it's a hot day as it's pretty cool in there. 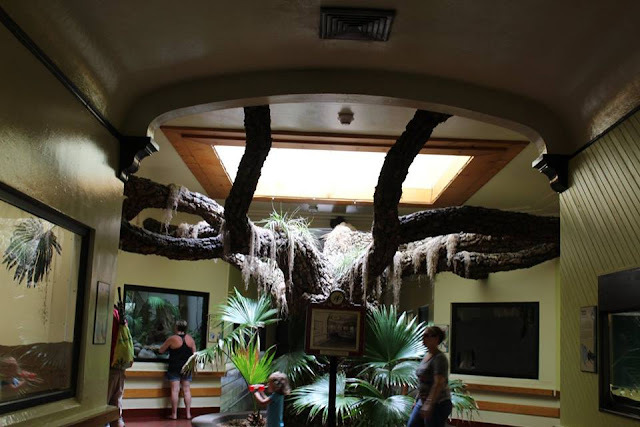 There are reptiles, bears, tarantulas, alligators, alligator snapping turtle, owls, and much more to see within ZooAmerica. 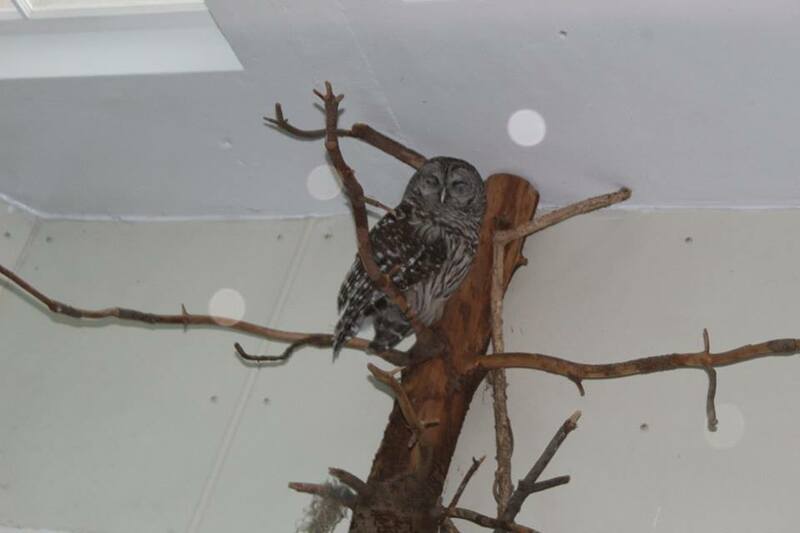 Here is the owl that we saw and I just loved him! Owls are beautiful animals to see. 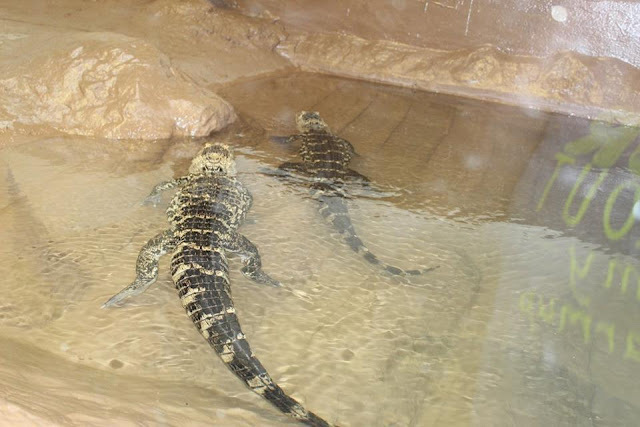 Here are the two alligators that we saw. They are fairly small and liked staying in the water. 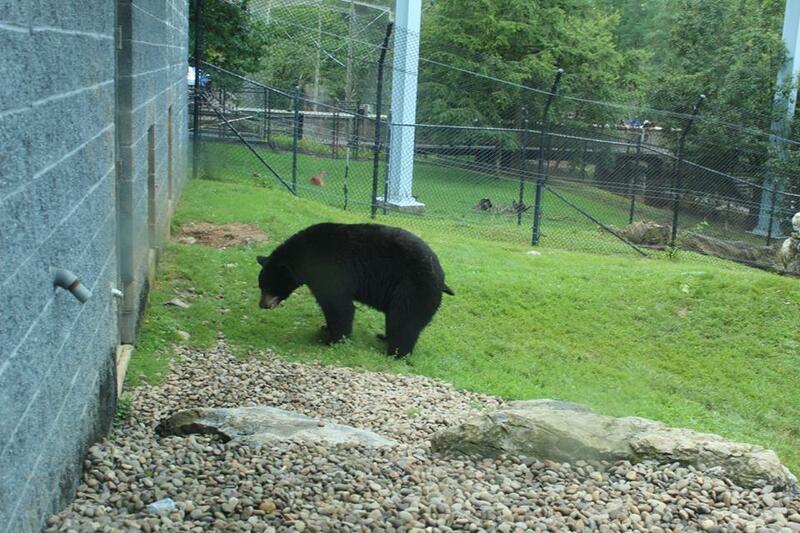 Here is the black bear we saw that was hanging outside walking around in the grass. Here is a brown bear that we saw and he was just hanging out in the water to cool off! Okay, onto the WET part of our fun filled day at Hershey Park! Our kids had a blast here. 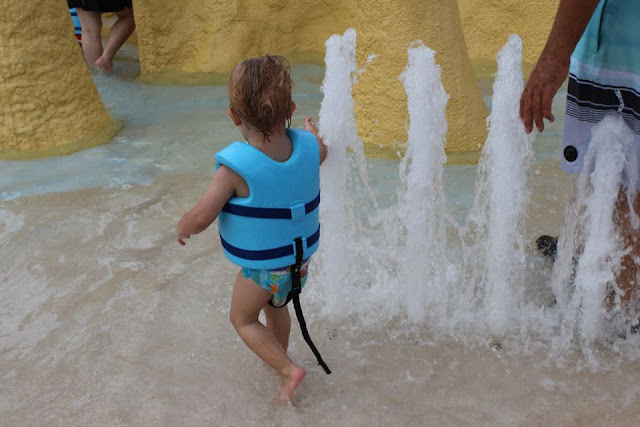 Our two year old absolutely had a BLAST at the water park within Hershey Park and was playing a lot, and loved the water slides he was able to go on, for his size. This right here was what I call a splash park, where the water spouts up unless you step on it. 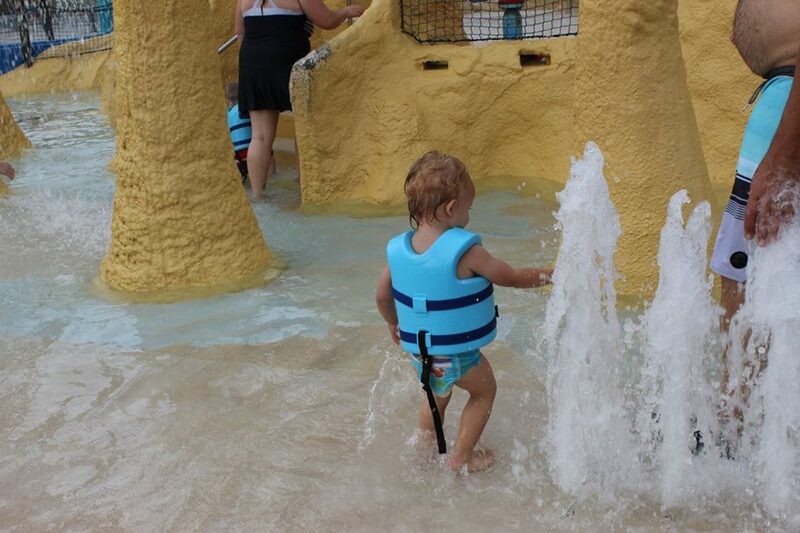 It was the shallow portion of the water park, and he had a lot of fun in this area with other kids. 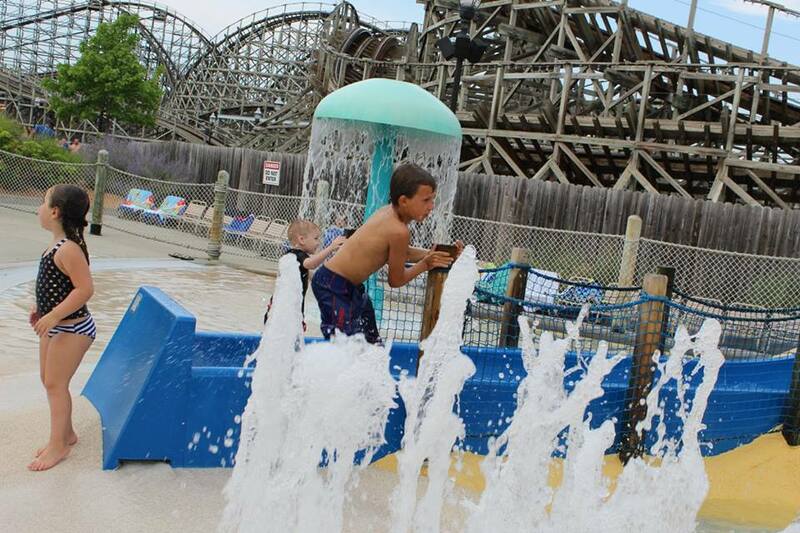 Here is another section in the water park where behind it is a wooden roller coaster, which is a lot of fun too! As you can see, this area is where the water slide is that toddlers are able to go down. He loved it and went on it with and without me sitting with him, and of course my husband was at the bottom of the slide to catch him! The water is shallow enough for small kids, and of course toddlers his height need to wear a park provided life jacket to be safe which is something I really like about this water park. In this picture, you can see more of the wooden roller coaster as well as the farris wheel. Here is another water slide that I went on a lot with our two year old, and he had a blast on it. Our older two kids went on it as well and had a lot of fun. This one goes a little faster of course, so at the end of it the water splashed into our faces. There was also a red water slide. 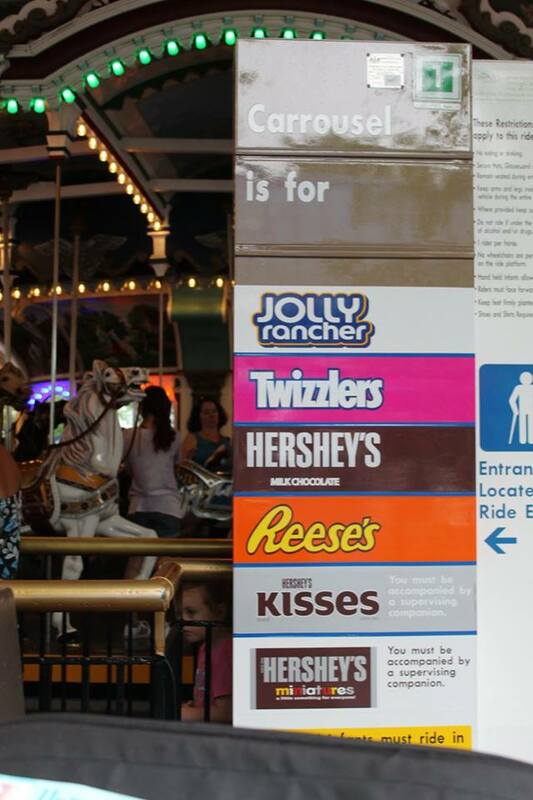 I sadly have never been to a Hershey Park before. My kiddos and I would love to get there sometime! My kiddos would love the water slide! Now I really want to go. This place looks so fun. Plus anything with chocolate available to eat I'm in. 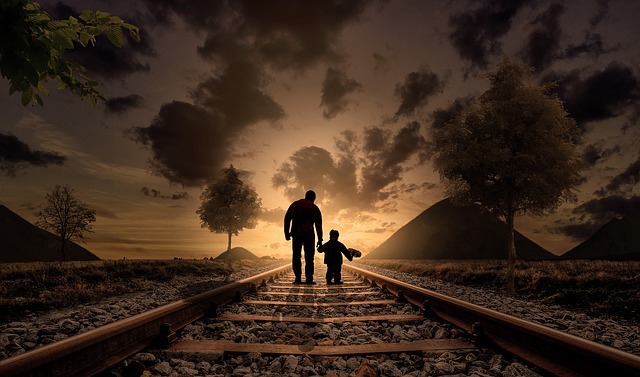 What a great place for an adventure with the littles! Our children are grown but maybe one day I can take grandkids to check out Hershey Park! Oh wow! That King Size shake went right to my hips just watching it! 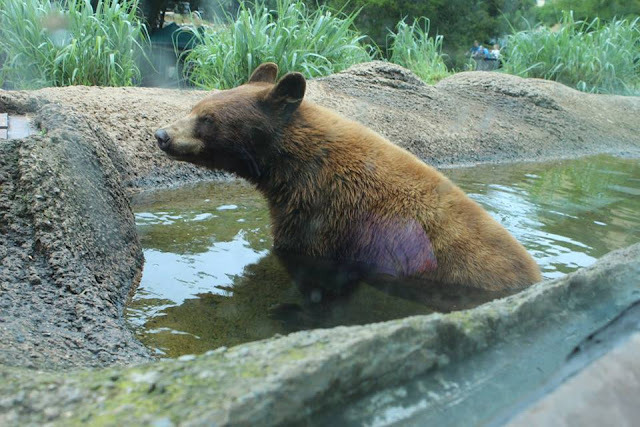 I think I would take a jog or two around the ZooAmerica to walk it off. Looks like so much fun. we went there a few years ago and absolutely loved it. A great place for little and big kids. We LOOOOOOOOVE Hersheypark!!! We were just there last weekend :) Always a fun time! We LOVE Hersheypark. We try to go at least once a year. There is so much fun for the whole family and something for everyone. 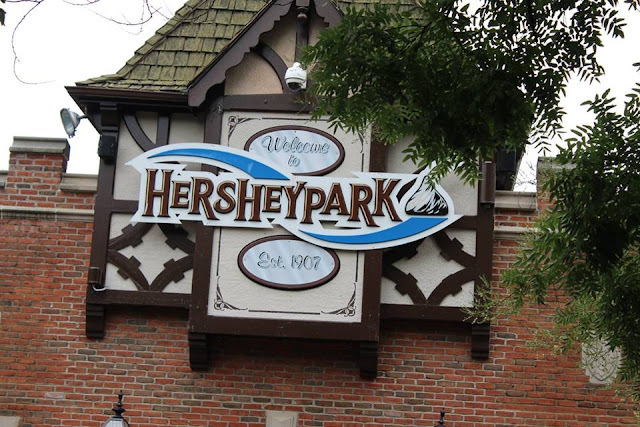 I have never been to hershey park but it sounds super fun! Maybe next time we venture that way! 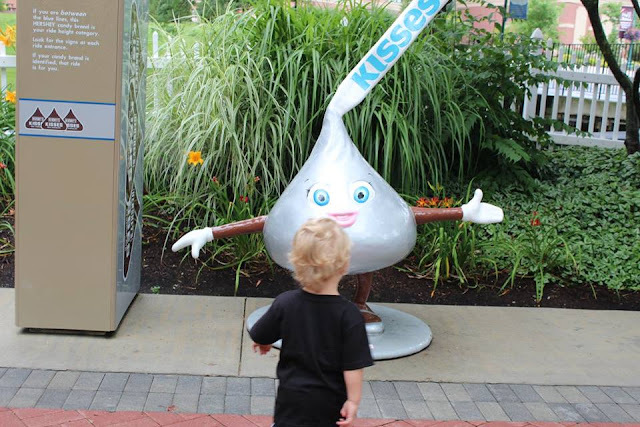 We went to Hershey Park a few weeks ago for the first time and had so much fun. The kids cannot wait to go back! 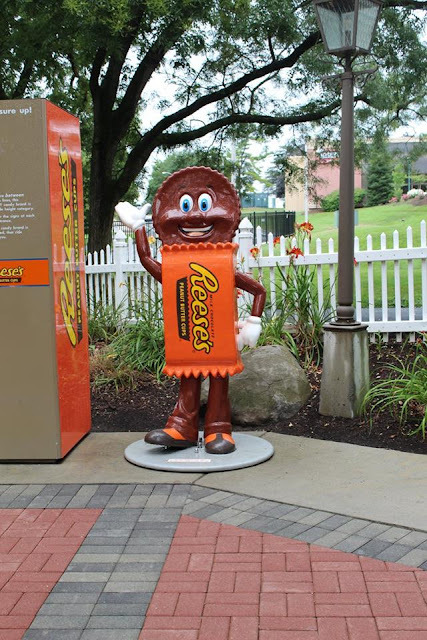 I would love to go to Hershey Park! It looks like such a fun place to bring the whole family on vacation! I've never been to Hershey park before! It looks like it is a lot of fun! I bet our kids would love to go! This looks like such a fun trip. I've always wanted to visit Hershey park. I know the kiddos would love going. OH the King Size Shake. I love it! One of the reasons why Hershey Park is a great family destination this summer. 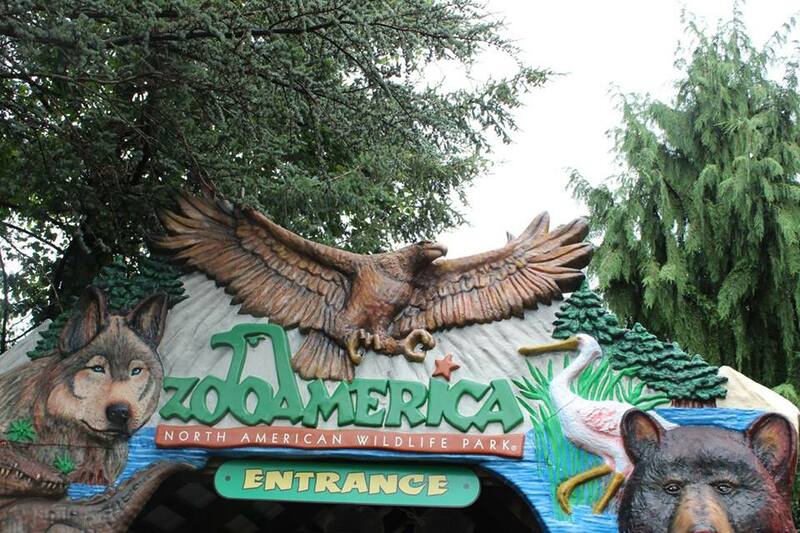 ZooAmerica looks great too. Fun learning experience for the kids to see animals up close! What an amazing variety of fun things to do!